The maximum poster format is A0 (landscape or portrait). 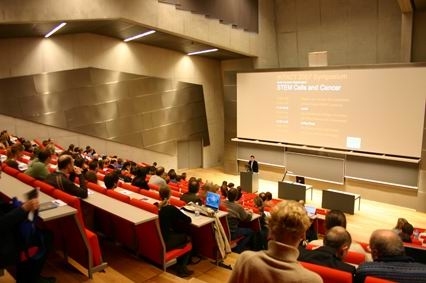 The symposium takes place at the Lundbeck Auditorium, University of Copenhagen, Ole Måløesvej 5, 2100 Copenhagen Ø.
Metro. Walking straight out of the arrival gate at Kastrup Airport in Terminal 3, you will after a few hundred meters find yourself in the Metro station. You will pass a ticket office on the way. Take the metro to Nørreport Station. Take the metro to Nørreport Station (about 15 minutes from Airport). From here you can walk to the venue (30 minutes), take a taxi (15 minutes), or take the bus number 150S or 6A (ask to be let off near Nørre Alle). You can read more about tickets for public transportation here. Taxi. You can also take a taxi directly from the airport to the venue or the hotel, however, in the rush hour (16-18) this might not be most efficient. Parking is easiest at the parking lot at Ole Maaløes Vej 5. You will need a daily parking permit, you can get one at the registration desk. Try the hotel search in hotels.com for 1 room Aug 17-18 within 2 miles from Universitetsparken (where the Auditorium is located, see google map above) with price in euro, CLICK HERE. Feedback? contact us at info@carbonhagen.com.